We hear a lot about the potential of Apple’s “magical” new devices to change the way people create new things. Some of this boils down to ace-level marketing, but when this reputation holds true, the results can be spectacular. Meet SoundPrism Pro 2.0 ($16), a revamped iOS instrument that justifies the iPad’s large touchscreen size relative to its smaller iOS siblings. This latest version (free unless you need MIDI) operates on both big and little screens — but on the big iPad screen, used with two hands, this app convinced us that this “iPod Touch on steroids,” as the iPad was cast by early doubters, was never a bad idea. SoundPrism Pro is a novel digital instrument and wireless MIDI controller (USB and Wi-Fi) is an evolved musical interface that allows musicians and neophytes to create harmony in any key with ease. The latest update brings speed, new sounds, and improvements on its already stellar user interface. When I tried the original SoundPrism for the first time on an iPod Touch, I was intrigued by its elegant interface design — a harmony-based layout of pitches which has no real parallel in the app world, and quite possibly the instrument world as well. With my first effortless arpeggio on the iPad’s larger screen, I understood why Apple released this nine-inch multitouch screen. A lack of MIDI support in the original app made me ache to see what my new favorite toy could do when not limited to the confines of its own sound bank. SoundPrism Pro’s MIDI integration fixed that problem, realizing the app’s potential as a legitimate composition tool with an ability to control any MIDI device or sound in your favorite DAW (digital audio workstation). However, an inability to multitask left a gap in SoundPrism’s potential for playing live music. Developer Audanika also simplified the user interface, allowing users to quickly swipe through menu options, and added a keyboard view to visualize chord inversions as well. A simple shake now brings up full screen mode, and the app sounds better overall with the help of an overhauled sound engine. Version 2.0 also adds in-app purchases so you can add to the four native sounds; for instance, the additional guitar sound pack costs two bucks. Changing keys is smoother than it used to be, but selecting a new sound still takes a second or so to load, so it’s best not to try and switch textures mid-song. Some criticize this app’s lack of editable sound banks, but to me, SoundPrism Pro is best approached as a distinct instrument, rather than as a replacement for your full-featured synth. You wouldn’t be mad at your saxophone for not sounding like a piano. Like any instrument, this one has strengths, like inspiring new chord progressions and voicings; letting you create arpeggios easily; and painting atmospheric/ambient textures. It also has a major weaknesses: melodic composition, which can be done, though its made difficult by the app’s unique pitch layout, which groups pitches as they build chords rather than in a traditional scale. That layout is what allows people with no knowledge of harmonic or key relationships to create complex soundscapes. You could know nothing about a chord or scale and still create surprisingly beautiful music with this app. If you have a basic knowledge of chord theory, switching on the pitch labels reveals the true genius of SoundPrism’s design. 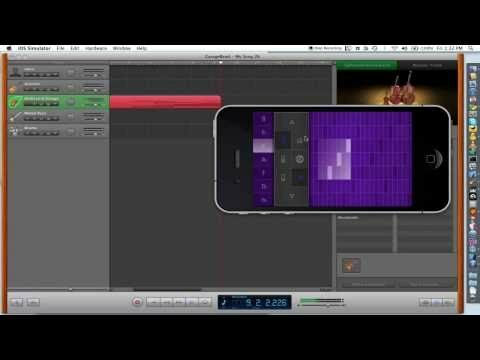 When you’re done messing around with the app within the quiet confines of your own iDevice, try connecting it to a digital audio workstation like GarageBand (depicted in the video below) and see what SoundPrism’s intuitive approach to chords inspires in you.